This pond pump is the work horse for pond owners. 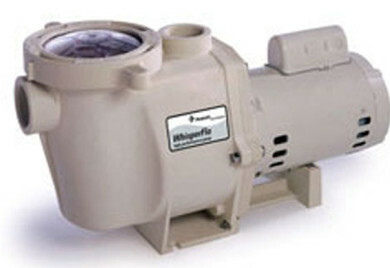 This pond pump along with an exterior filter will keep the pond maintenance to a bare minimum. Made for continual use. Does not get hot and is very quiet. Recommended for smaller ponds with waterfalls. We call it the WhisperFlo high performance pump for good reason. This innovative hydraulic design moves water more efficiently and more quietly than competitive pumps. Under typical operating conditions, WhisperFlo offers the highest water flow of any high performance pump—yet with the lowest electricity consumption. And, WhisperFlo is designed to be a tireless workhorse. Its engineered thermoplastic housing withstands extreme heat and resists corrosion. The commercial grade motor frame has a rustproof, stainless steel motor shaft and sealed bearings that never need lubrication. Engineered to provide optimum performance in any size pool or pool and spa combination, WhisperFlo is built to last a lifetime, and as a result, has become the industry’s top seller for years. A leader in Pond Supplies – A Leading Supplier of Air Pump for ponds!